In my ongoing effort to manage storage on my iDevices, I wanted to share with you guys a neat feature, once again, that Dropbox offers (I wrote a similar post a few months back). For those of us who enjoy taking photos and videos with our devices, we know that they will take up a lot of storage. This can pose a problem, especially if one only has 16GB of storage. Instead of using iCloud or Photostream to back up your photos (I avoid ever connecting my devices to iTunes), Dropbox presents a great solution. Backing up photos is extremely important, in case we ever lose or break our devices. b) there simply is not an easier solution for getting your videos onto your PC. 1. If you haven’t already, enable Camera Uploads in Dropbox. In Settings in the Dropbox app, toggle Camera Upload to “On”. You can do this with ALL your iDevices. Now, each and every time you have the Dropbox app open on your particular device, it will automatically upload new photos and videos that you have taken. You do NOT need to do anything. 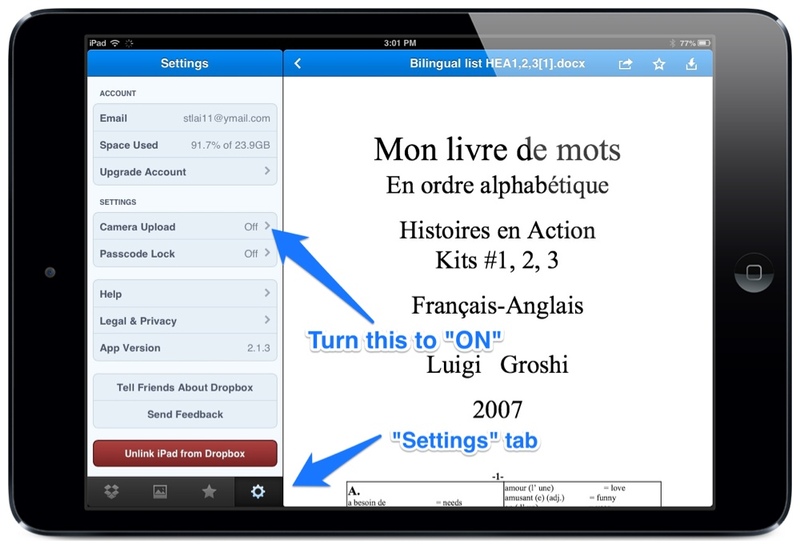 Once files are uploaded, you can now freely, without worry, remove them from your iPhones/iPads. 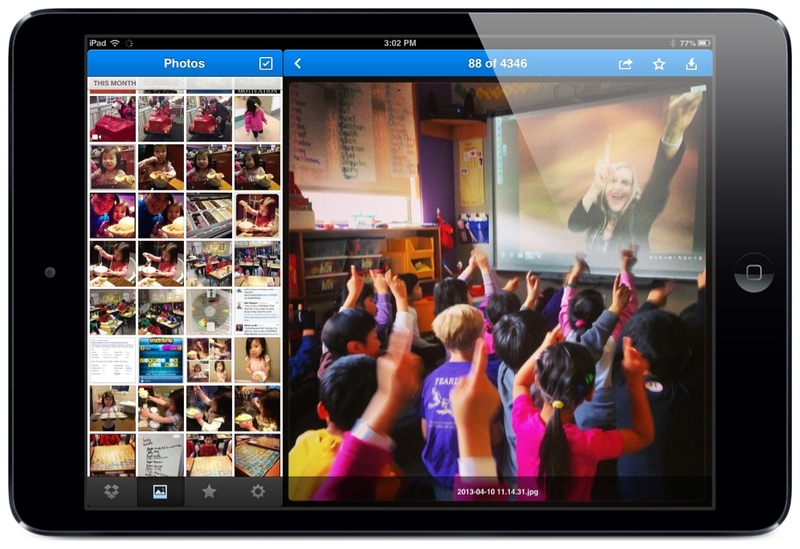 Obviously, if you plan on using any of them in apps such as iPhoto or Skitch, you will not delete those. A: Move the files elsewhere! You may see from the first screenshot that I have quite a large amount of storage (23.9GB) in my Dropbox. If you do not have as much, this is what you do: Back up your photos/videos either by moving (or copying) them into your PC or an external harddrive, or to an online photo storage solution such as Smugmug. If you move them, your Dropbox will then be freed of that space. For instance, I just transferred 137 short videos from my Dropbox to my Smugmug overnight. Now I can delete all of them off BOTH my iPhone and my Dropbox! Check out a few ways on how to get more free space on Dropbox. Remember, just by setting up Camera Upload, you will receive up to 3GB extra for free! This is just another example of not having to connect your iPhones to your computers to do the same thing. I just like the fact that the uploading takes place in the background, and most of the time I am not even aware it is happening. Uploading will occur each time you open the Dropbox app on your device (It will pause after a few minutes of non-use). 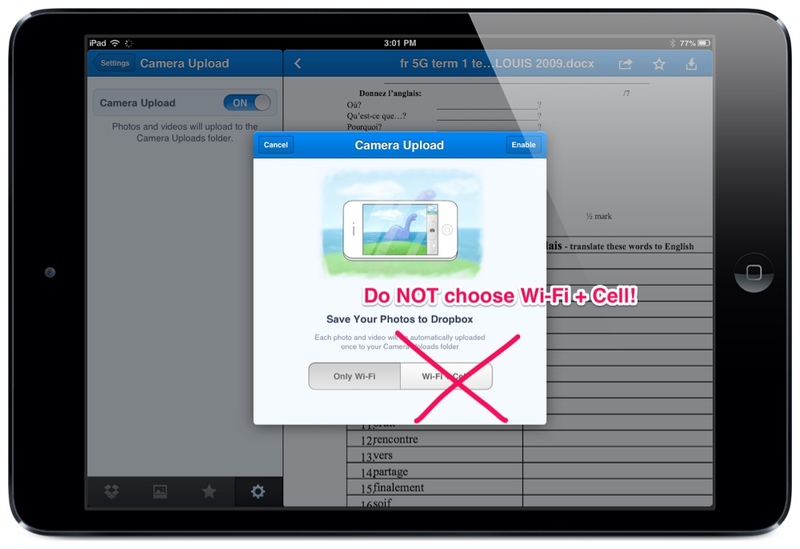 Note: On your iPhones (or iPads with 3G/4G), ensure that uploads are happening on WIFI only, and not CELLULAR. You will use up data unnecessarily if you choose CELLULAR. Also: Facebook and Google+ (link) also have a similar feature where it will upload all photos and videos. I guess it will depend on personal preference for which one to choose. I would suggest not using Facebook, since they pretty much will take ownership of the photos and reduce file size (and therefore quality). For me, Dropbox is much more convenient since it syncs with my PCs already, and therefore the files are already on my PC instead of just in the cloud. Let me know if and how this has worked out for you! Previous Post Thank You TeacherKit! I have 40 videos on my iphone 5S and only 2 have transferred to Dropbox. It has been 24 hours and no more than 2 have uploaded. I have tried with WIFI and without. I do have over 100G of space available in Dropbox. Suggestions? How long are your videos? If two have successfully uploaded, then the set up should be correct. Try deleting the Dropbox app and restarting the process. Let me know how it goes. All I had to do is log out and log back into the iPhone app, start over and they all uploaded. Wow! That sounds very simple. It is by far the easiest way to backup iOS videos. Removing photos from iPhones / iPads (after they are backed up) will help you save a lot of your phone memory.